Use a kitchen scale to help determine the density of various ingredients. 4 How Much Does 1 Pound of Ground Beef Cook To? Measuring cups tell you the volume, but pounds indicate the weight. In order to convert one to the other, you must know the density of the object you are measuring. A pound of feathers fills more measuring cups than a pound of pebbles. The pebbles have a higher density. In cooking, the same principle applies. Most ingredients have different densities, but you can overcome this with a kitchen scale. These usually display the weight in ounces, but with a little math, you can convert your weight to pounds. 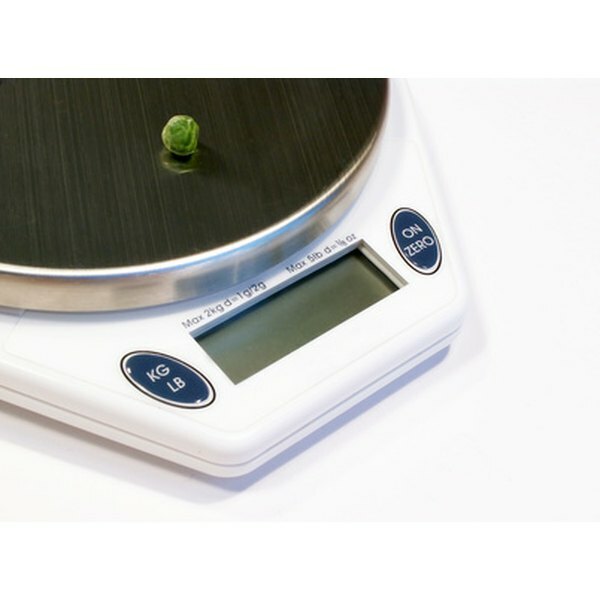 Weigh the empty measuring cup on your kitchen scale. Measure one level measuring cup of an ingredient and place the full cup on the scale. Subtract the weight of the empty cup from the full cup. For instance, if your cup empty weighed 3 oz. and full of flour weighed 7.5 ounces, the weight of the flour equals: 7.5 – 3 = 4.5 oz. Divide the number of ounces by 16 to determine the weight in pounds. For the example, 4.5/16 = 0.28125 lbs. Multiply this number by the total number of measuring cups required in a recipe for that ingredient. For instance, if a bread recipe requires 4 cups of flour: 4 x 0.28125 = 1.125 lbs. Does a Lemon Pound Cake Freeze Well?